The winner of the No. 1 title on the Dreamcast has been decided!! Which of the 127 Dreamcast software titles has come out on top? All will soon be revealed, starting from here!! Sega Enterprises, Research & Development Department 2. Claiming First Place with more than twice the votes of the Second Place getter!! 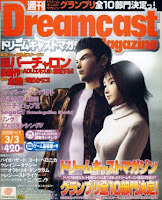 The First Dreamcast Magazine Grand Prix is to decide the king of all the Dreamcast software titles from the release of the Dreamcast through to last year ’s releases, with voting opened in the end-of-year edition of Dreamcast magazine. The result of that vote is now here at last. Within the voting deadline of Jan 20, we ended up receiving 4791 postcard votes and 702 online votes made just for Best Creation (by users of dricas.com, with prevention of multiple votes) for a total vote count of 5,493 votes. Before continuing, we would first like to express our thanks to all Dorimaga readers and all Dreamcast users for your participation. And now, with all 10 Sections including Best Title having been decided, each award will be announced below together with words of thanks from the recipients of each award. First up is the Best Title Award to decide the top Dreamcast software title, awarded to “Shenmue Chapter One ~ Yokosuka ~”, with 1,995 postcard votes and 176 net votes for a total of 2,171 votes – a whopping 39.52% of all votes. A presentation ceremony for each award was held with departmental representatives, with a trophy to be delivered at a future date once the nameplate has been engraved. 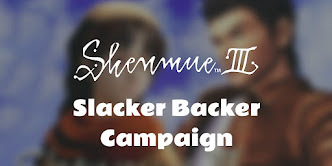 The creation of Shenmue lasted for more than 4 whole years, and has given people plenty to talk about. “Chapter One ~ Yokosuka ~”, which was released at year end, has enjoyed overwhelming support from Dorimaga readers and so has now been acknowledged as sitting at the pinnacle of Dreamcast titles at this current point in time. As he crosses paths with many people, the main protagonist Ryo grows in maturity and the player also becomes emotionally involved. 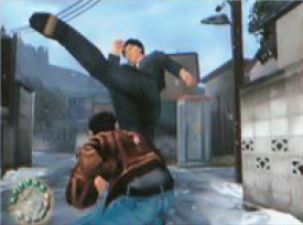 With AM2 elite members brought on board to work on the graphics, choreography and sound, Shenmue was completed after a period of more than 4 years. 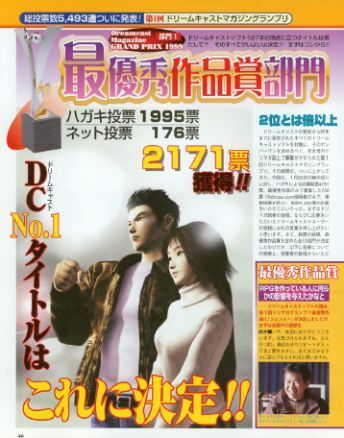 In addition to the Best Title award, Shenmue also makes its presence felt in the other Award Sections. This pair shot is reminiscent of when the Saturn edition of Virtua Fighter took the First Saturn Magazine Grand Prix. AM2 remains in good form! Best Title Award: Words of Delight from the Winning Creators!! 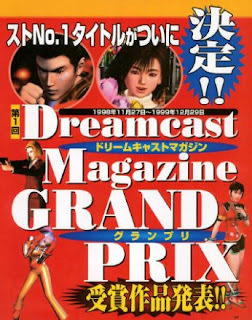 DM: Shenmue has been chosen as the First Dreamcast Magazine Grand Prix Best Title, the top software title for the Dreamcast. 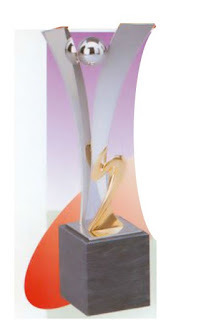 Firstly, how do you feel about receiving this award? Yu Suzuki: Thank you very much indeed. It kinds of gives you a boost, you know? (Laughs) Recently I’ve heard some people are replaying it, and I hope people will continue to enjoy it for a long while yet. Is he already turning his attention to “Shenmue Part 2”? For those who haven’t yet played Chapter One, now’s a great time to experience it. DM: I was expecting it to be quite a close battle, but after lifting the lid the winning margin was pretty big, wasn’t it? 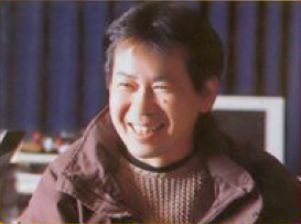 Yu Suzuki: I’ve carried out various research surveys, and it seems that there’s quite a high level of satisfaction among people who bought it. Or, maybe a low level of “betrayal” – of course, it depends on the person but it might be a factor in the high level of satisfaction. 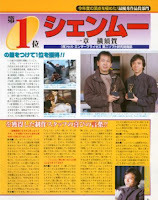 Keiji Okayasu: For us, Chapter One of Shenmue serves as the model for everything. Looking at Chapter One, we will continue with the things that worked well, and adjust those things that didn’t. So it’s more about focusing on how we can improve ourselves as creators, rather than how the game itself can be improved. Having said that, I think that Part Two will go well and more smoothly than the previous game. 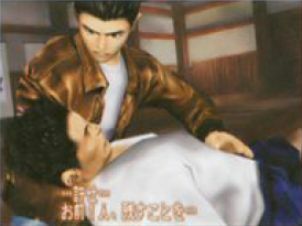 DM: What kind of game is “Shenmue Part Two” looking to be? 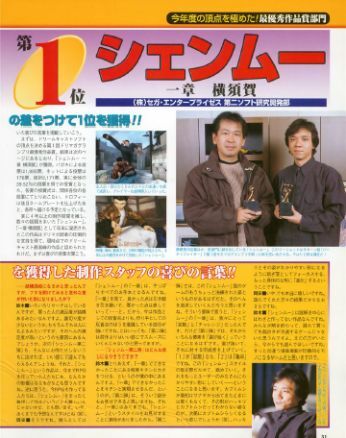 Yu Suzuki: For a start, to a certain extent we will be able to properly settle some things we weren’t able to do in Chapter One – that’s something I want to achieve: to realize the things we couldn’t do in Chapter One. I think we’ll be able to show those things in Part Two. Also, the whole point of Chapter One was to show off the “Shenmue” style. With Part Two, it will take shape from a little more refinement to this Shenmue style of game. I think that’s the direction we will most likely be pursuing. In that sense, for us Chapter One of Shenmue was about “spreading broadly” and “challenges”. 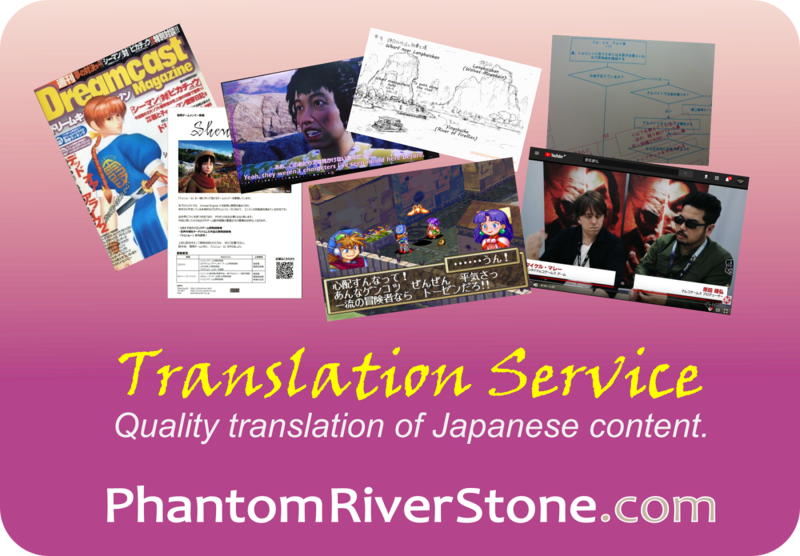 However in Part Two, it’s likely that we will be picking out various elements from those, and polishing them further. If 1 was about “spreading broadly” then 2 is about “focus”: highlighting and heightening this Shenmue style. I think it will be about putting that into a form that’s easily accessible to players. It’s like the Japanese rhinoceros beetle: at first as it comes out of the pupal stage it’s not black at all and it’s hard to even tell from its shape whether it’s a rhinoceros beetle, but in time it eventually grows into its true shape. (Laughs) It means pruning and focusing its form into something well-defined; evolving to a more definite shape. Keiji Okayasu: But I’m really happy. Even more so because the result is from people who have played the game. Mr Okayasu is a laid-back person, but confesses his delight. We can’t wait for him to show us the sequel. 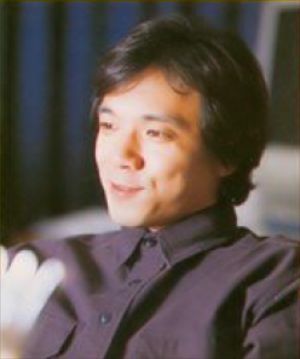 Yu Suzuki: Shenmue is a game that we have deliberately not based around puzzle solving. I don’t think it’s a game where the fun is cut in half if you buy it late after everyone else has finished solving it. If there are people who are yet to play it, I encourage you to start playing even now. Because I think it’s a game which surely will have something memorable in each of the scenes you encounter. Thanks for the translation. 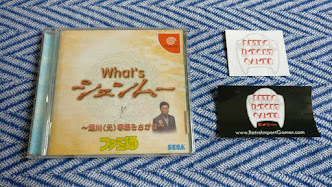 I enjoy reading about anything Sega/AM2 related. Looking forward to part 2. Glad you enjoyed it. 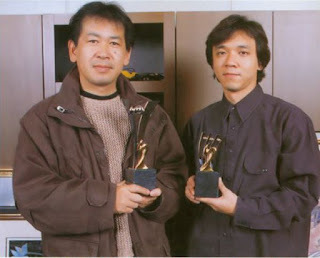 I think it's great Yu was able to get so many members of the original team like Keiji Okayasu back to work on the Shenmue 3 project.